June 4th, 2016 Coming off the heels of severe weather and flooding rain, another week of active weather is close to the end for Texas & the Brazos Valley. The Flash Flood Watch has expired for all of the Brazos Valley but we still have the possibility for a little bit more rain. A few possible showers overnight but most likely wont wake or keep you up. A mostly cloudy start to Sunday but looks like it will be a mostly dry morning. We could have some afternoon to evening rain and storms develop again but the chance is low at 30%. Any storms that do form could enhance our already high waters with more rainfall but our severe weather threat remains low. Rain and storm chance continues for Monday but drops down to 20% with mostly sunny skies. Not warm enough for you? We continue the drying trend next week, with rain chances very few and far between, plenty of sun, and highs near or reaching 90. In other words, there's light at the end of the tunnel. Another day where rain dances on and off across the Brazos Valley with some areas picking up more rain than others. Isolated rainfall totals of 2''+ will be enough to create flooding problems and storms could certainly dump that amount in an hour. Low pressure system over the Lone Star State will exit but first it'll give us one last round of scattered thunderstorms through the day on Sunday. To finish the weekend, a couple thunderstorms will be possible but we'll see more sunshine and temps warming into the mid 80s. The Flash Flood Watch has been extended until Saturday evening. At the moment, widespread flooding does not look to be an overwhelming concern. Soaking, more widespread rain is likely Saturday, but thanks to the scattered, hit/miss nature of this weeks storms, we aren't expecting widespread flooding. That being said, isolated rainfall totals of 2''+ will be enough to create flooding problems, and storms could certainly dump that amount in an hour. We'll continue to watch this very closely, since more rain is not something we need at the moment. Area of low pressure still off to our west continues to send disturbances near us which is why we still have rain chances throughout the day. Showers and thunderstorms look likely once again to begin and end Friday. Similar to how Thursday was, on and off rain, while some pick up more than others. At the most - expecting a quick inch or two as a possibility with isolated storms. Quiet weather looks to continue to end the day, but we'll be watching for additional development to our west and south for our rain chance tonight. At the most - expecting a quick inch or two as a possibility with isolated storms. Tomorrow, widespread rain and thunderstorms look possible once again, then again on Saturday. Upper low has reached the Brazos Valley with storms and rain falling just before sunrise. Heaviest rainfall and storms for the Brazos Valley look to be from 10 am to noon. Scattered rain and storms stick around through the day but taper off some into the evening. The slow moving upper level low that has brought the rain since Monday reached West Texas Wednesday afternoon. That low will slowly move east across the Lone Star State bringing daily, widespread rain and storms...along with the threat for more flooding. Overnight -- the Brazos Valley is expected to remain generally rain free. Can't / won't rule out a stray shower to a thunderstorm -- but overall, it should be a quiet night. Next round of rain and storms will be possible as early as sunrise Thursday and expected to continue off & on through the day. While there is a decent chance the entire day won't be a wash out, a better part of Thursday (at this time) is expected to be wet. An additional 1" to 2" of rain is possible for many -- additional totals of 3" -4"+ cannot be ruled out with stronger storms (along with thunder, lightning, and gusty winds). 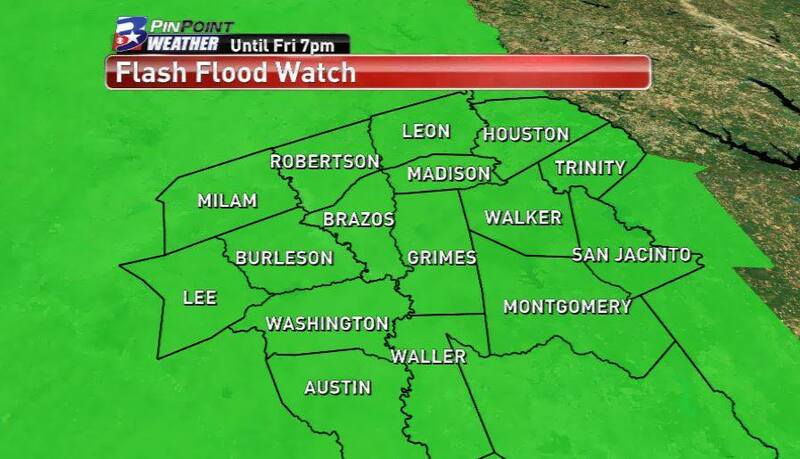 The Flash Flood Watch has been extended to include the entire Brazos Valley until Friday evening at 7pm. The threat for heavy, potentially flooding rain remains through the end of the week. An additional 1-4"+ is likely, with isolated amounts of 6"+ still not out of the question. 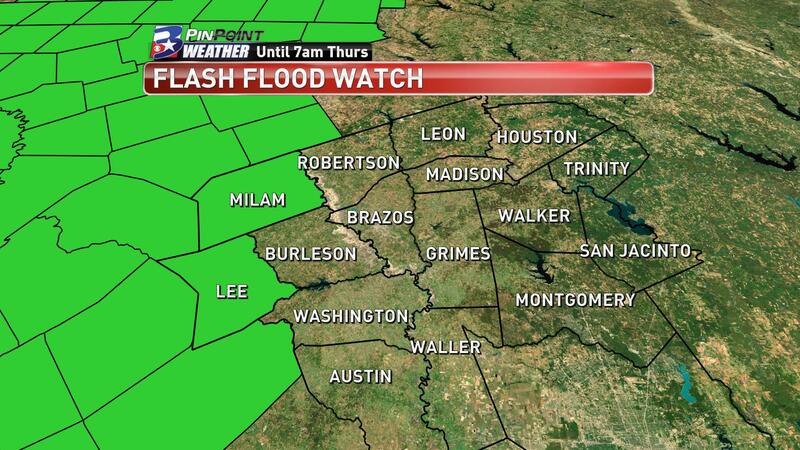 A FLASH FLOOD WATCH has been set into place for Milam and Lee Counties until 7am THURSDAY. While the rest of the Brazos Valley is not included -- at this time -- there is a chance that the National Weather Service could extend that east sometime Wednesday or Thursday. Tuesday evening brought a round of rain and storms that moved west to east over a matter of hours (6pm - 10pm). 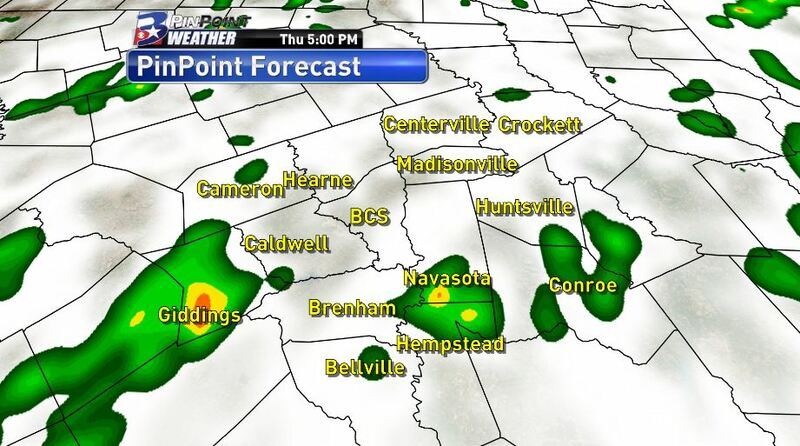 Another round of activity is expected to develop / pass through the Brazos Valley Wednesday. While this timing & placement is not perfect -- it shows the possibilities for the day. Scattered rain to a few rumbles of thunder are possible as early as the pre-sunrise hours. Scattered rain and storms will continue off and on through the afternoon / early evening. While the overall severe weather threat is low -- cannot rule out an isolated strong to severe storm at times. Gusty winds / small hail will be the main concern -- other than heavy rainfall. Speaking of heavy rain -- an additional 1" to 2" + will be possible with Wednesday's activity. The National Weather Service is monitoring a large portion of Texas for heavy rain over the next few days. The Brazos Valley is under a SLIGHT RISK for Excessive Rainfall each day. The heaviest rain -- at this time -- is expected to remain concentrated just west and southwest of the area. 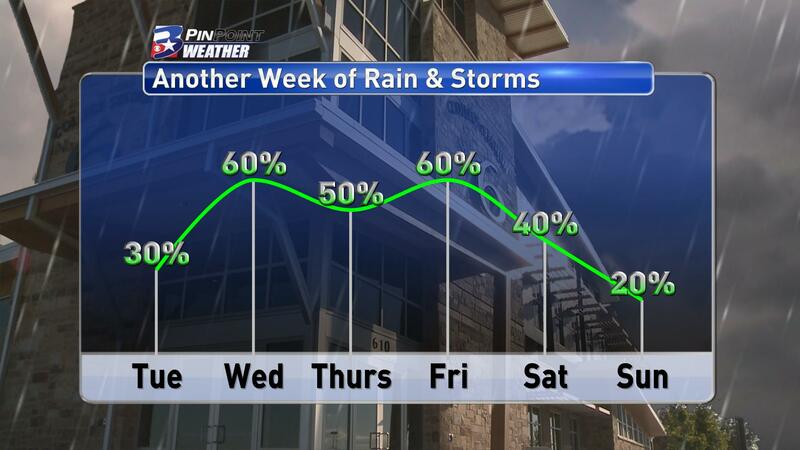 The overall outlook at this point remains unchanged -- rounds of rain and storms over the next few days. The exact timing, location, and totals will be tough to nail down due to most of this activity being driven by small scale features. That said, a widespread 2" to 4" is possible for most, with localized areas of 6" to 8" not out of the question. The overall look of the forecast over the next few days remains consistent at this point. The threat for heavy rainfall and flooding remains priority one, but there is a possibility of severe weather on Wednesday afternoon, though isolated. 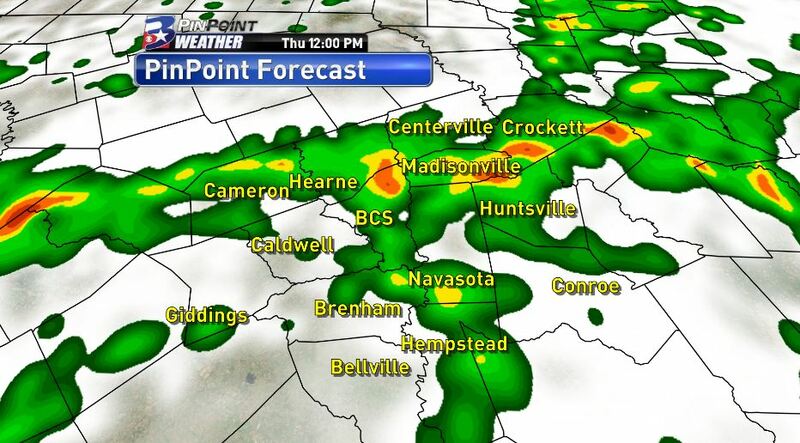 Here is a look at what our PinPoint model wants for rain all the way through Friday evening. Wouldn't get hung up on specific locations, but widespread 1-3'' looks likely from now until Saturday, with localized amounts of more. Stay tuned as we continue to fine tune this forecast. As of Monday evening, an area of low pressure was centered over the far western edge of the Desert Southwest. That area of low pressure will spend the day Tuesday moving east toward the foothills of the Rockies / just west of Texas. By Wednesday, low pressure is back in the western reaches of the state. It is expected to stall / move at a snail's pace to the east out of the Lone Star State through the start of the upcoming weekend. All of that spells out the chance for multiple rounds of rain and thunderstorms -- some strong to severe. The coverage of activity is expected to increase by late Wednesday. From there, we'll need to take it day-by-day -- however, daily storms and potential heavy rain is in the outlook. Can't rule out a light shower to kick off the day Tuesday -- however the better bet for rain and a few storms arrives by Tuesday afternoon. While very likely not a perfect outlook, it shows the potential the day holds. At this point, the area is outlined for the possibility of thunderstorms -- however, severe weather is not highly expected. Passing downpours, thunder, and lightning cannot be ruled out. The Brazos Valley -- along with most of Texas -- is outlined in a SLIGHT RISK for Excessive Rainfall Wednesday. That threat will continue through the remainder of the week. Forecast rainfall totals are tricky this early in the forecast. Where the strongest / possible severe storms set up and where the heaviest rain is expected is something that will need to be monitored as this event unfolds. Small-scale features are going to drive those specific aspects of the forecast. As of now, we'll call for a possible, additional 2" to 3" of widespread rainfall, with localized 4"+ not ruled out. Something to monitor for and prepare for -- especially for those that remain flooded / just had flood waters recede. 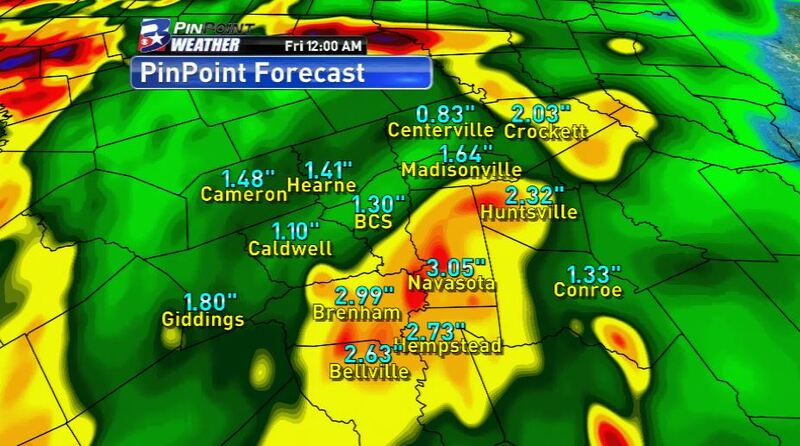 More through the week on KBTX.com and on the weather page of KBTX.com.